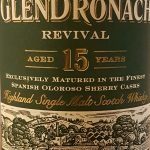 As you might have heard, Billy Walker sold Glendronach (Benriach and Glenglassaugh included) to the beverage giant Brown-Forman earlier this year. I find this quite sad, considering how he managed to elevate these distilleries to a new level. We can only hope that the new owners will not change too much in the way of production. Billy will, of course, not sit around twiddling his thumbs. 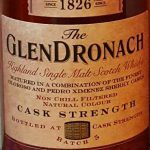 In June he acquired Glenallachie from Chivas Brothers and I hope to see some promising Whisky flowing out of that distillery soon. Business aside. 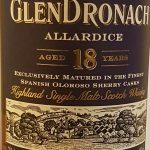 I have three Whiskies here from said Glendronach Distillery while Billy was still in charge: The 15 year old “Revival”, the 18 year old “Allardice” and Batch No.5 of the Cask Strength version. This on starts on Grandmas stock, a little briny. Then come the Sherry guardians: dried figs and raisins. Quite a bit of oak on the nose, also some fruit chutney. Not the most complex of noses but quite nice. Powerful sweet arrival but also dries quickly. The oak is kicking about and doesn’t want to calm down. When swirling this around the mouth for a bit it becomes quite chewy. That is something I love in Whiskies. Also some canned peaches with honey develop. Not really in the same league as his older siblings, feels a little doctored. Nonetheless a fine tipple.